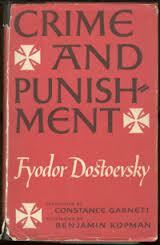 Themes in Crime and Punishment research papers examine Dostoevsky's themes. Research papers on the themes in the novel Crime and Punishment by Fyodor Dostoevsky. Our writer explain the main themes within the novel and provide research on how they enhance the novel. From the outset of Dostoevsky's Crime and Punishment, it is readily apparent that Raskolnikov sees himself as disconnected from the rest of the people surrounding him. Both his status as a student (albeit one not currently engaged in scholarship) and his squalid poverty identify him as distinct from the majority of the people in his immediate proximity. Although he is desperately impoverished, there is a sense that it is transitional, and that he, unlike many of the working poor in his neighborhood, will ultimately be able to transcend the depths of poverty. Of course, this may simply be the sense that Raskolnikov conveys out of a desperate attempt to disassociate himself from his disheartening surroundings. Regardless of the reason, the text is clear on the point that Raskolnikov sees himself as distinct from the social hubbub of the masses that encircle him. By all suggestions, it appears that viewing himself as somehow innately different and distinct has long been a habit of his thinking, forming the analytical lens through which he regards everything about his current dilemma. However, “something new was taking place within him,” and his detachment from society is being replaced by a compulsive desire to observe people in their native surroundings. However, this compulsion seems rooted in pathology, rather than an earnest desire for social interaction, as it has a distinctly voyeuristic tinge to it, and it ultimately serves only to compound his already profound sense of disaffection. If the crimes are viewed as the primary impetus of Raskolnikov’s psychological degradation, his sense of detachment only worsens in the aftermath of the crime. None of the many social contacts he makes during the post-murder period offer him any comfort or satisfaction, as he still views himself as fundamentally distinct from those around him. Systematically, throughout the course of the novel, Raskolnikov rejects every person who seeks to form a connection or lend assistance to him. It is only in the conclusion of the narrative that Raskolnikov has regained his sense of emotional equilibrium to the degree that he recognizes his love for Sonia. Poverty - Poverty Research Papers are custom written on the sociology problem of Poverty. Social Isolation - Social Isolation research papers looks at the issue why children socially isolate themselves and why school violence and suicide are often outcomes of social isolation. Character Sketch of The Brothers Karamazov - Character Sketch of The Brothers Karamazov research papers analyze each character in Dostoevsky's classic novel. The Brothers Karamazov - The Brothers Karamazov research papers look at the novel by Dostoevsky and often compare it to his classic Crime and Punishment. Symbolism in Crime and Punishment - As one of the most prolific writers of the 19th century, Fyodor Dostoevsky incorporates a number of complex symbols into his writing, each of which has the ability to represent a number of deep political, social, and religious issues. Jeremy Bentham - Jeremy Bentham research papers look into the life of the British philosopher best remembered as the father of utilitarianism. Notes From Underground - Notes From Underground research papers report on Dostoevsky's novel on modernity. Ivan, Alyosha and Dmitri - Ivan, Alyosha and Dmitri research papers discuss the Brothers Karamazov by Dostoevsky. Mikhail Bakhtin - Mikhail Bakhtin research papers look into the Russian philosopher who produced work on semiotics and the philosophy of language. Nietzsche - Nietzsche research papers overview the great Nietzsche's philosophy on God, morals and ethics. Order a research paper on Nietzsche from Paper Masters. Friedrich Nietzsche - Friedrich Nietzsche, a German philosopher who criticized the Western view of reason, traditional morality, and religion’s focus on the spirit of man. Literature Symbolism - Literature Symbolism research papers discuss the literary devices employed in literature to give meaning to objects or events. Paper Masters writes custom research papers on Themes in Crime and Punishment and examine Dostoevsky's themes.